Those more experienced than I at using them on horseback will hopefully chime in, but I think the lower opening would make it easier to see your reins. And on foot they enable you see what your stepping on (or in). I have the houndskull side-hinged visor style of helm, like you had. And I CANNOT see through the mouth. This may be due to the different style of helm or the shape of my face/eyes/cheeks. When oriented properly on my head, the mouth sits at chin-level and are just out of view of my most obtuse downward visual angle my eyes can manage. If I didn't have cheeks or bottom eyelids, I believe it could be possible to see out of the mouth. I can see through the other breath holes, for downward vision. These types of bascinets actually had very good ability to move your head and neck and looking down is aided greatly by the mobility. In my houndskull, I'm pretty sure the mouth is specifically to aid improved breathing. The majority of breath holes are on the other-side of the snout from this photo, but I think you can make out a few holes that are oriented just above the level of the mouth on this left side view. I have visibility out of those holes. As for why it is protruding from the rest of the mask, I'm not positive, but as I mention it is right at the level of my chin, and the holes are somewhat larger than the rest of the breathes, and it might be set away to give extra clearance to lessen the likelyhood of tips of pointy objects like a misericordes or acutely pointed swords from reaching your chin. That's just a hypothesis. Also, note that the eyes in houndskulls and klapvisors also have eye slits that jut-out from the rest of the visor. This moves the holes further from your face. This obviously takes more work than just cutting a slit and moving it further from your eyes reduces angle of vision. So I think it is done to give better protection by moving the hole further away from your soft bits and also providing a glancing surface. Terry, you make several good points abut the Occularia on these helms. 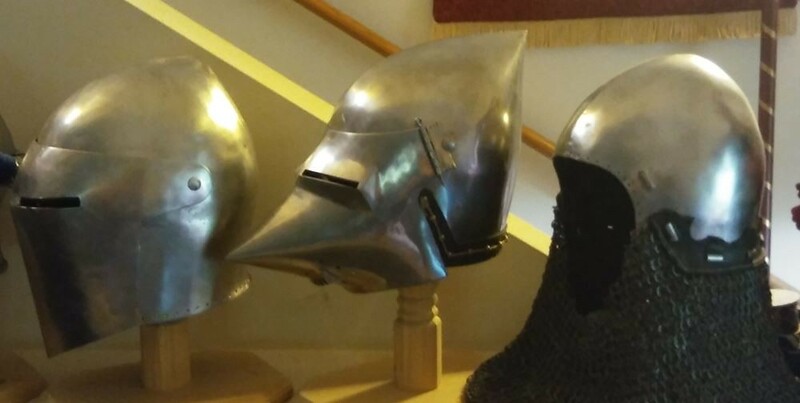 However, a 'reproduction' is only as good as the knowledge and skill of the person who made it, and I can say with authority that no one can make a truly accurate 'reproduction' of a real piece of plate armour without extensive handling of real pieces, and even I have handled only one 'pig face' bacinet (Wallace Collection). If the smith thinks the 'mouth' is there only to help breathing, he will likely position it as close to the mouth of the wearer as he can. This is not the case in those real visors that have a 'mouth', however (not all have that feature); the angle looks to me to be about 50 to 60 degrees down from the horizontal. Now, having said that, it is important to note the differences between the typical German 'Klappvisor' and the more Italian (yes, I know they were used all over, but the ones we have either usually have Italian marks or were made by ethnic Italians) 'pig face' side hinged visor. The German visors are typically shorter and closer to the face. I don't know as much about them, having only seen them through glass. The angle looks about the same to me, though. The raising of the slit serves, I would say rather clearly, to keep blades or spear points away from the slit by deflecting the thrust away from the slit proper. It is a very old principle adopted in helm construction, shapes are almost invariably meant to deflect blows as deflecting is better than thickening the iron/steel/bronze sheet in order to withstand blows. As recently as in 1956 the East German Army adopted an horrendous bell shaped, almost cone shaped helm design that Adolf Hitler had rejected as un-german in 1944. The Greek Corynthian helmets had an apparently unuseful high elongated skull, the result not a fancy fashion, but of a careful design aimed at deviating blows, the design was also extremely elegant but they had great artist engineers at their disposition. The raised slits in basinets will accompany most blows away from the slit proper, assuming that the blade wouldn't be quite perpenducular to the slit, which probably doesn't happen so often in a combat.